Cardiff independent, Holy Yolks, plants 100 trees in Mbale, Uganda. 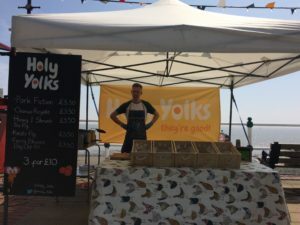 Holy Yolks are a small Cardiff-based independent, selling delicious handmade scotch-eggs out of Cardiff Central Market and at the Riverside Farmers Market. You may also have sampled their (and I quote) ‘oozy orbs of joy’ at a number of delicatessens, coffee shops and pubs across Cardiff. Kev, business owner and Chief Egg Roller heard about Size of Wales through a friend. As Holy Yolks is a business with a strong ethos for sustainability and being environmentally friendly, Kev suggested to his team that this Christmas they do away with Secret Santa and instead donate the budget to Size of Wales’ Ten Trees for Christmas campaign. Their donation of £30 means they can now proudly declare that for Christmas Holy Yolks have planted 100 fruit trees in Mbale, Uganda! These fruit trees will be planted in the gardens of families across the heavily deforested district of Mbale, providing 100 impoverished families with a source of vital nutrition, and a small income from the excess fruit. Many thanks and Merry Christmas to the team at Holy Yolks! If you would like to do the same with your colleagues, group of mates or family, visit our campaign page for more info.